Can few minutes in the confinement of your own thoughts cut off from all distracting sounds and sights help you gain insight into yourself? Can it relieve you of guilt or pain? Is it so easy to accept your own faults and ponder over what could have been the better way? Can I really find myself? These questions often cross my mind and when they do, I am restless. Often I have contemplated meditation but ambient noises pilfer my concentration and I am left struggling with my restlessness. Matri Mandir at Auroville, Pondicherry promises the absolute silence in company of similar seekers of peace. A trip then materialises from nowhere and I grab this opportunity in hope to filter out the noises. When I reach Auroville, the crisp morning is laden with hushed murmurs and curious whispers. There is an aura of mystery surrounding the golden orb that glimmers in the soft light of the morning sun. Barring a few, most in the early morning group are first timers who have booked for concentration time at inner chamber of Matri Mandir. Piere, a volunteer at Auroville, explains us the concept of meditation before leading our small group down the path to the inner chamber. A short video documentary at Auroville visitors’ center later, a shuttle has deposited the group near the Matri Mandir where we hand over our cell phones and cameras. Pierre takes it from there. We are advised utmost silence and not to chant any religious incantations aloud. “It is a place for deep concentration on your inner self” he insists. But human tendency is such that when you are asked to refrain from certain things, most of us do the exact opposite and hence the group whispers along the short stone pathway through the garden guessing what awaits us. The orb named ‘Matri Mandir’ by the ‘Mother’ who envisioned it as the ‘Soul of City’ rises up in front our eyes as if breaking ground. Twelve gardens individually named as ‘Existence’, ‘Consciousness’, ‘Bliss’, ‘Light’, ‘Life’, ‘Power’, ‘Wealth’, ‘Utility’, ‘Progress’, ‘Youth’, ‘Harmony’ and ‘Perfection’ signify the twelve attributes of mother, the supreme force of nature. Twelve red stone petals form the entrances to the marble lotus pond under the golden sphere and four main entrances to the inner chamber. The entrances placed in cardinal directions are named Maheshwari, Mahakali, Mahalakshmi and Mahasarswati each symbolizing various aspects and supreme qualities of Mother Nature. Each red ‘petal’ has a concentration room named after twelve virtues of ‘mother’. To one side is an old banyan tree that spreads out in wide expanse marking the geographical center of ‘Auroville’ and on other side is the amphitheater in the center of which is the white lotus bud shaped urn containing soil from different countries and each state of India. 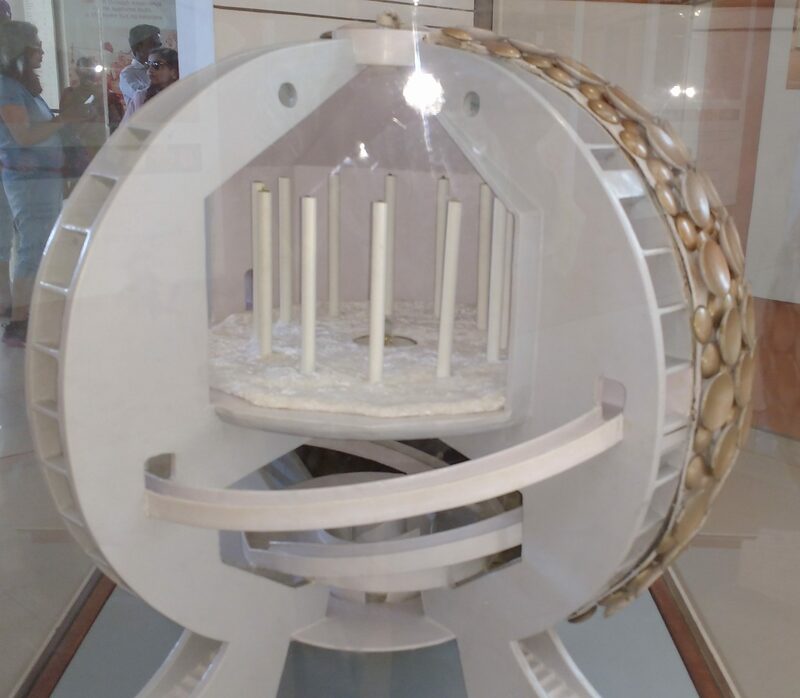 It is through the ‘Mahakali’ gate that our little congregation is herded inside the huge golden ball which is bathed in absolute white inside. Awed by the alabastrine interiors and the magnitude of the spherical space an immediate hush falls on us and like the tamed children we fall in a line. A huge white marbled ramp circles along the spherical side leading to the upper hemisphere where in lies the inner chamber. Ascending the white stone cold ramp in silence, I am intimidated. It feels like I am leaving all chaos of material world behind….I feel humbled. Along the walls are panels with water running over the serrated stone…the sound so soft that it enhances the silence inside…I feel lonely as if on my final journey to heavens above. Inner chamber has at its center a crystal orb that suffuses the single ray of sunlight on the white walls, columns and the white low seating. As the group is guided inside, every person occupies a soft cushioned seat as do I. The already silent chamber is gradually enveloped in semi darkness as the dim lights are further dimmed. Twenty minutes…just twenty minutes is what each of us gets to concentrate and contemplate on the entire life! A first time applicant to meditate in such tranquil environs, I find myself bewildered. And yet I cannot concentrate again. My mind wanders; for some time towards my partner who could get a seat further down the wall and for some time towards my neighboring seat where a white haired woman seems to be crying with silent tears rolling down her cheek. I cannot see across the room but the vibe is strongly somber. A sudden bright flash of light signals the end of our session and our group files out towards the lotus pond under the gold sphere. I am subdued; the power of silence and solitude weighs heavily upon me. Life at Auroville is about finding yourself in selfless service to others. I love the concept of one world with no religious dogma, no political boundaries, no social differences. It is about having humanity; of purity of soul, of being one with supreme power with a clean heart. It is then that the epiphany strikes… My ambitions, aspirations and desires still occupy most of my conscious mind. I am not yet ready to give it all up. I still am not forgiving enough. I am yet to rise above anger. I did find myself that morning at ‘Matri Mandir’ after all. I know now that I am still far from achieving peace. The life at Auroville is not for me…At least not for now. Also read Enidhi’s experience here. All bookings are accepted on an individual basis and only in person. Email or telephone booking are not available for first-time visitors for concentration. Bookings are accepted only up to a week in advance. 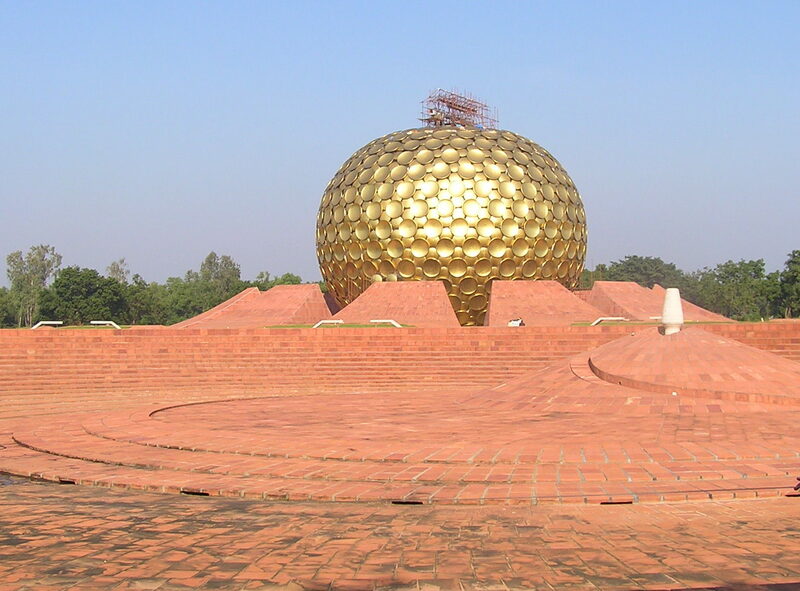 Permission is granted to those who have seen the videos and exhibitions on Auroville and the Matrimandir. Requests can be made up to seven days in advance. The number of places is limited. Passes for concentration are issued at the Visitors Centre on the day of appointment or just before the departure to Matrimandir with the shuttle. Children below 10 are not allowed inside the Park of Unity and the Matrimandir. Interesting. Ty for sharing.. added in my travel list! also suggesting to provide website if available of the place you visit. Wonderful narration and beautiful pictures. Since you have mentioned that cameras/mobiles are not allowed inside, how did you manage to get these pictures? Would love to know how to book tickets for entry as first timer? First time visitors have to visit their centre in the complex and apply in person at least a day prior to the intended day of meditation.